I was soo excited when I saw that Whimsie Doodles were having a design team call. They were the first company I ever bought a digital stamp from when I rediscovered card-making and are my go to company for cute digital stamps. I LOVE their images and own quite a few of them! I would love to be part of their team. I wanted to make a couple of cards for my entry instead of linking to a past post. With December just around the corner I just had to make some Christmas cards (I love making x-mas cards!!). 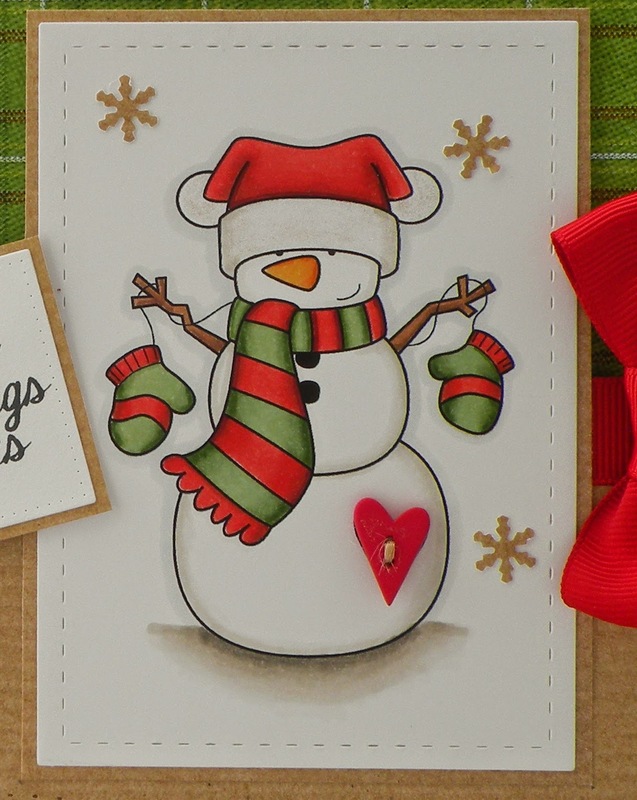 For both cards I used one of my favourite Whimsie Doodles images called Snowman. For my first card I kept with the traditional Christmas colours of red and green and threw in some kraft card for extra 'warmth'. I coloured him in with my copics and added a heart button. I used Wink of Stella Clear Glitter pen on the pom poms and rim of his hat but it's very difficult to pick up in the photos. For my second card I used non-traditional colours for a 'cooler' card! I also decided to try out a couple of techniques that I have not tried out before - making a shaker and creating my own background paper. Considering I was watching TV when I made the background paper it didn't turn out too bad - a bit squinty in places, but that makes it even more unique....well thats what I tell myself anyway. He was also coloured with copics and fuzzy cut. I used Glamour Dust instead of Wink of Stella on his hat - it shows up so much better in the photos! Squirrel's World of Craft - SNOW-vember! Thanks for taking the time to look and hopefully see you again soon. Enjoy the rest of your day. I really like how you interpreted our 'ribbon and / or lace' challenge at Crafty Catz. Very creative and really beautifully! Thank you for joining us and don't forget to come back tomorrow and see who is the winner. Wow, gorgeous snowmen cards. 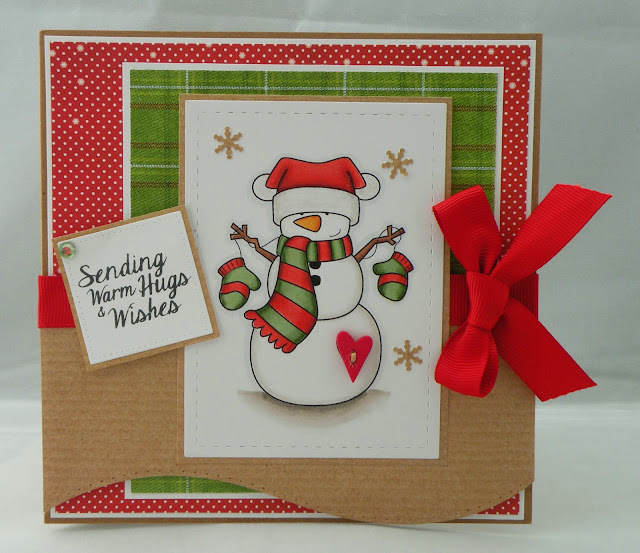 Good luck with your DT call and I'm really glad you've joined in with the Snowvember challenge on Squirrel's blog. Hi Andrea! What an ADORABLE card. You are super creative, and I thank you so much for sharing your talents with us. Please join us again real soon. P.S. I'd just LOVE to have you play along in these other challenges that would fit your sweet card just perfectly. I hope to see you again real soon. Your cards are SO lovely! 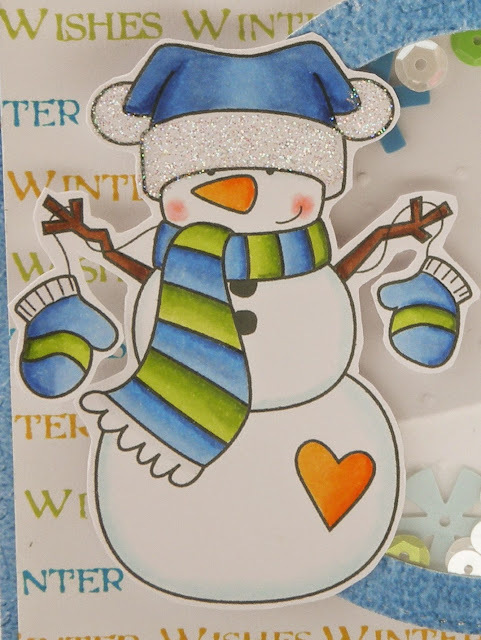 Super cute little snowman cards! Love all your matted layers! Great fabby red bow!